Let's cut right to the point -- this house is killer. I'd be cute about it, but, this home is so good, it speaks for itself. Designer Megan Rice Yager filled this Santa Barbara craftsman-type home with totally charming Chinoiserie and brings East Coast prep style to Southern California. The gorgeous front door is painted Ben Moore's "Stratton Blue" - a perfect complement to the earthy grey shingles. 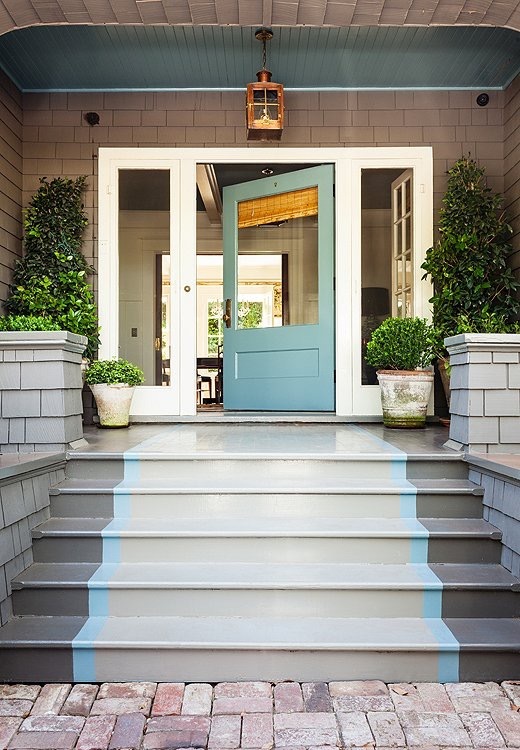 Love the gas burning lantern above the entry, and the fun painted runner detail on the steps. Hydrangea blue and leaf green is one of my all-time favorite color combinations, so this living room is definitely tickling my fancy. The mis-matched chairs with contrasting upholstery and throw pillows, and craftsman millwork and moulding painted all-white keeps a breezy California vibe alive even as the room is chock full of super trad staples like blue and white Chinese porcelain, and silk taffeta drapes. That John Rosselli bamboo lantern is welcome in any room as far as I'm concerned. This bar cart and oversized painting make a lovely living room vignette. Plus we get a better view of the tape trim detail on the drapes. And a friendly scooter giraffe! Yager upholstered the top of the wall in this room with Scalamandre's "Shanghai" fabric (one of The Greats, as far as I'm concerned), and trimmed out the edges in red gimp. Yes. And I am obsessed with board and batten paneling that goes three-quarters of the way up a wall, so I'm pretty much dying over here. Be still my heart. Antique silver and a turquoise Christopher Spitzmiller lamp grace a lovely wooden side board. Even though the living room has all white walls and trim, don't think Yager is afraid of wallpaper. Here she employs another one of the patterns I hold most dear, Scalamandre's "Baldwin Bamboo." Love the ginger jars displayed on wall brackets. Proving dens don't need to be dark to be cozy, Yager painted this petite library a neutral taupe and filled it with an awesome orange velvet sectional. A tartan roman shade is a great choice for a traditional space. And orange lacquer built-in shelf keeps a youthful vibe alive, as does the modern art. Leopard throw pillow and Hermes blanket are always going to be welcome. Greige cabinets contrast with white windows and a white ceiling. Wonderfully veined marble adds dynamic pattern to this other very calm space. I love the beautiful brass sconces above the window, the brass cabinet hardware, and the natural wood top of the island. The master bedroom is bright and light, yet sumptuous. Colefax & Fowler's classic "Bowood" fabric is employed on the headboard and the kick pleated pelmet treatment above the bed. A back and gold Chinoiserie mirror and another Christopher Spitzmiller lamps (this time in a deeper blue-turquoise) sit regally on a vintage chest. Light green silk taffeta draperies with light blue green key tape trim (matching the light blue walls), all grounded by a leopard print carpet?? I die. I'm dead. I'm blogging from beyond the pale. The master bath is graceful with off-white walls and cabinetry grounded by dark wood floors. Framed sea fans and a collection of creamy corals remind you that you are indeed at the beach. Man oh man, how much do I love the daughter's bedroom! Fabulous Rose Cummings wallpaper in a cherry red petite animal print lines the walls and contrasts wonderfully against the shimmering turquoise pelmet treatment above the bed. As if the pelmet weren't enough, a big ol' red pagoda-inspired birdcage dangles sassily. Also, there aren't enough French caned beds in the world, so I am definitely supporting this one. Chain link embroidered shams with a dual colored monogram make this space even better. Another Rose Cummings wallpaper, this time a blue Zebrine, runs up the wall and over the steep eaves of the young son's bedroom. I love the balance of the crazy wiggling zebra stripe and sober and traditional menswear stripe on the carpet. Vintage wooden beds contrast against the decidedly midcentury brass sconces. I don't know if you've noticed, but I don't always love particularly subtle things. I like some pop, some pizazz, some in-your-face personality. When some jazzy and chic combinations can be made eminently livable, comfortable, friendly, and welcoming? Well that's what great homes are made of!